a stair forming part of a sloping gangway in a building of purpose group 5 in accordance with S3.28. The number of tapered treads shown is indicative only; there must be at least 3 treads in total in a flight, but the number of tapered treads is unrestricted. In the case of tapered treads, subject to S3.12 to S3.14. The combination of maximum rise and minimum going will result in a pitch steeper than this. a stair lift projecting into the width may be fitted to a stair within a dwelling. There are additional stair width requirements for escape stairs in Part E.
S3.5 The aggregate of the going and twice the rise must be at least 550mm and not more than 700mm. S3.6 A flight must have uniform rises, each at least 75mm. S3.7 The depth of a tread must not be less than the going. S3.8 In a flight, or in that part of a flight which is straight, the going measured along the centre line of the flight must be uniform. v. between a landing and an adjoining level where the route of travel from the adjoining level to the next flight changes direction through 90 degrees. nosings distinguishable through contrasting colour or tone. This standard does not apply to a private stair in a dwelling. S3.12* In that part of a flight consisting of tapered treads, the going of the tapered treads must be uniform and must not be less than the going of the straight treads. At the inner end of the tread the going must be at least 50mm. S3.13 In a flight less than 1 metre wide the going must be measured at the centre line of the flight as in S3.2. 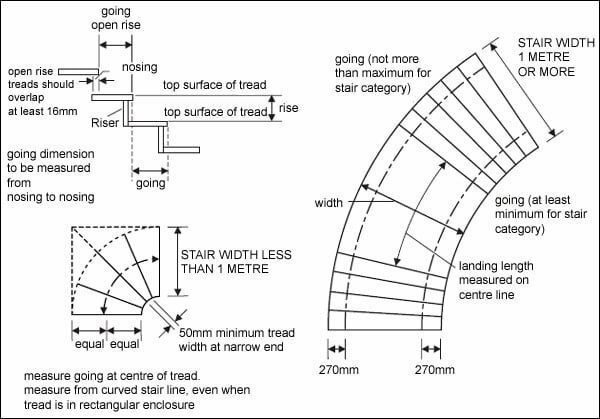 S3.14 In a flight 1 metre wide or more the going must be measured at the two points 270mm from each end of the tread as in S3.2 and the minimum going must be at least the going of the straight treads. S3.15* A flight consisting wholly of tapered treads must be constructed so as to give safe passage. The requirements in S3.18 to S3.25 for landings, so far as they apply to intermediate landings between floors, and for handrails, and for headroom, do not apply to such stairs. a ramp serving a single dwelling. 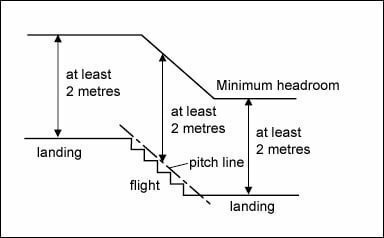 S3.18 A landing, level except for any necessary slope for drainage, must be provided at the top and bottom of every flight of a stair or ramp. ii. a dwelling or private garage ancillary to a dwelling and the ground, balacony, conservatory, or porch, other than a door required to be accessible for disabled people under Part Q, where the change in level is not more than 170mm. c. a door may open onto the bottom landing of a flight such that at any angle of swing a clear length of at least 400mm is left across the full width of the landing. b. a private stair in a dwelling connecting two or more storeys may have a handrail on only one side. b. a stair between an entrance door to a building and ground level which does not form part of an escape route. S3.22 A handrail must be fixed at a height of at least 840mm and not more than 1 metre, measured vertically above the pitch line of the flight or surface of the landing. S3.23 A handrail must extend at least 300mm beyond to top and bottom of a flight and have a profile and projection that allows a firm grip. where the handrail serves a single dwelling. S3.26* An industrial stair or fixed ladder serving areas requiring limited access in any building must be contstructed so as to offer safe passage. S3.27* A stair or fixed ladder in an agricultural building must be constructed so as to offer safe passage. S3.28 In a building of purpose group 5 where steps form part of sloping gangways serving areas for audiences or spectators each step must have a rise of at least 125mm and not greater than 190mm.